One man’s quest to help save lighthouses is going to lengths few would dare imagine, let alone undertake. 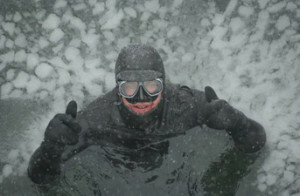 On February 26, 2011, Gary Sredzienski, known affectionately along the Piscataqua River region and beyond as the “Creek Man”, will take to the river’s frigid waters to raise funds for the nonprofit American Lighthouse Foundation, based in Rockland, Maine, and the foundation’s local chapter, the Friends of Portsmouth Harbor Lighthouses. For his part in the upcoming “Swim for the Lights” event, Sredzienski will swim a total of four miles, departing from Odiorne Point in Rye, New Hampshire at 1:00 pm and ending the feat on the shores of Maine at the Kittery Point town dock around 5:00 pm. 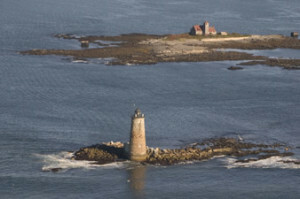 During the swim’s route, Sredzienski will also make brief stops at the wave-swept Whaleback Lighthouse in Kittery and Portsmouth Harbor Lighthouse in New Castle, New Hampshire. In doing so, he ensures a profound connection is made between lighthouses and his commitment to them. For starters, anyone who has ever admired a lighthouse or considered these beacons irreplaceable treasures in our lives and communities knows how special lighthouses are to the cultural fabric of the coast. Regal and vigilant by nature, lighthouses have long embodied the notion of helping our fellow man in his greatest hour of need, but today in a twist of irony, it is the lighthouse that now needs saved before it too late. The effort to save lighthouses requires the hands of many – and of course, a few civic-minded heroes who help lead the way by doing something above and beyond in nature that can serve as an inspiration to a host of others. Gary Sredzienski’s “Swim for the Lights” will challenge his well-trained ability to fend-off physical exhaustion and chill with each stroke he makes in the waters of the Piscataqua River on February 26, 2011, yet he remains undeterred. Here is where you can help…and no, you don’t have to get wet. By becoming a “Swim for the Lights” supporter today from the comfort of your home, you will join Gary Sredzienski in spirit on February 26, 2011 and help raise funds for lighthouse preservation. The power of one person can be great – but such efforts ascend to even greater heights when we join in and rise up together! Let’s show Gary how much we truly appreciate his commitment, which embodies the finest the human spirit has to offer by helping a cause that beckons people near and far! Following the swim, Gary & his band, the Serfs, will play at a celebration party beginning at 5:00 pm, at Captain and Patty’s restaurant, 90 Pepperell Rd (Route 103) in Kittery Point, ME. Tickets are $15 per person and can purchased online.